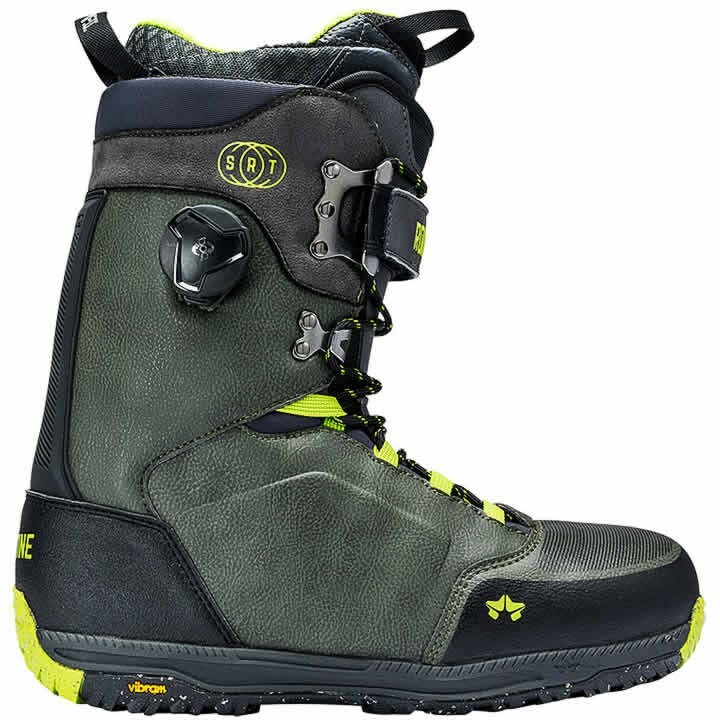 New for 2018 the Rome Libertine SRT Snowboard Boot is the result of riders demanding some of their favorite boot tech sunk into the tried-and-true flex of the Libertine. To start Rome upgraded the Libertine chassis with a Vibram Griplight Outsole and Rome's internal BOA HeelLock Harness. Then they integrated the new PowerStay Strap that gives 3x the power control over shell closure. The result is a blend of all-terrain medium flex with features created for fit, response and traction. The Pro F.I.T. liner features heat-moldable Performance foam designed to resist packing out and provide superior fit and comfort. From burly cliffs to high-consequence jumps, the Libertine SRT injects a futuristic blend of Support, Response and Traction to your riding. Internal Boa HeelLock Harness: Featuring an in-out design where Rome uses Boa to focus powerful control over the ankle region of the boot. Used to step up the tech of traditional lacing boot models, Rome's Boa HeelLock Harness follows a pattern that runs over the ankle region of the shell tongue. If you want strong heel hold, crank the Boa to focus closure at the ankle. With the Boa reel located on the outside of the upper cuff, you can modulate your lacing power in the ankle area as the day goes on. PowerStay Strap: Rome has designed the PowerStay Strap - Rome's unique power strap configuration - to increase the leverage over closing the upper cuff of your boot. With Rome's custom-designed double speed hooks, the PowerStay Strap connects to and pulls on the eye stays of your upper cuff. The result is more powerful cuff closure to give you the option of adding power and response to your turns. Double speed hook strap anchor is attached to the eyestraps. D-ring for added leverage. GripLight Outsole with Vibram IceTrek.2: Found in Rome's high-end Guide, Folsom and Libertine SRT boots, Rome's advanced GripLight outsoles are designed to optimize lightweight, dampening materials. Rome also engineers them to work with the V-Rod concept found in Rome's bindings where the flex pattern drives power edge-to-edge and lets your system tweak side-to-side . Integrated with this lightweight, flex-correct design, Rome uses two Vibram compounds - IceTrek.2 and ECOSTEP - to take traction to a new level for hiking hits or climbing lines.